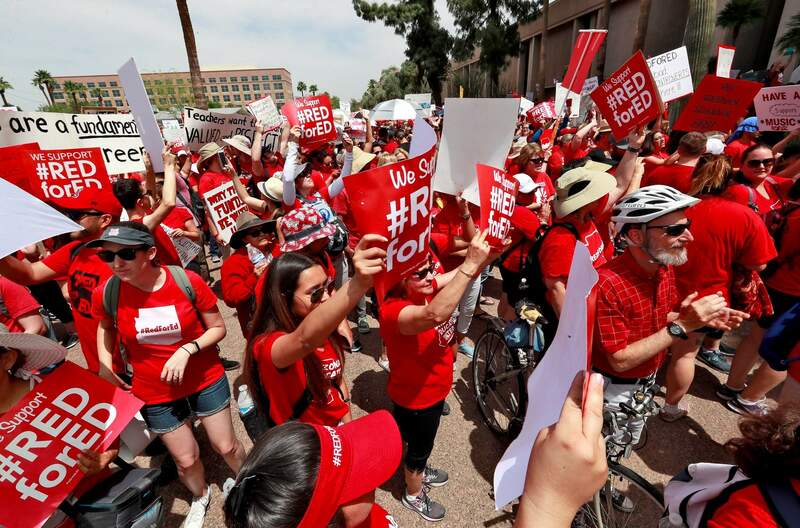 Teachers rally outside of Arizona Gov. Doug Ducey’s Executive Tower on Monday in Phoenix on their third day of walk outs. Teachers in Arizona and Colorado walked out of their classes over low salaries keeping hundreds of thousands of students out of school. It’s the latest in a series of strikes across the nation over low teacher pay. 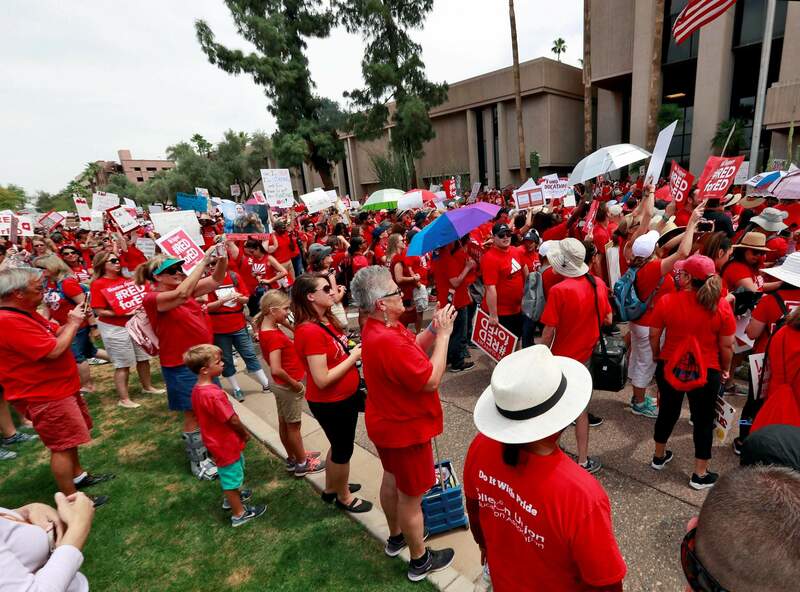 PHOENIX – Thousands of Arizona teachers gathered for the third day at the Capitol on Monday to protest low pay and school funding, and many schools around the state remained closed, while the Legislature prepared to introduce a budget package that gives them raises but falls short of other demands. Teachers rally outside of Arizona Gov. Doug Ducey’s Executive Tower on Monday, in Phoenix on their third day of walk outs. Teachers in Arizona and Colorado walked out of their classes over low salaries keeping hundreds of thousands of students out of school. It’s the latest in a series of strikes across the nation over low teacher pay. She said her district’s schools have worn out central air conditioning, fire alarm and security systems that will cost millions to replace. Some educators are concerned that the governor’s pay raise only goes to teachers with set classes and not support staff like counselors or bus drivers or people like reading specialist Jodi Walker, who teaches at the Apache Junction Unified School District. Monday’s rally drew as many as 10,000 teachers, according to estimates from the Department of Public Safety, and the leader of the national teachers union, the American Federation of Teachers. Despite the presence of the state and national unions, the Arizona walkout is mainly led by a grassroots group of teachers that mobilized after a strike in West Virginia in a movement that’s spread to several other states. “As they say they need me here, this where I’ll be,” she said. “I know those are demands by some people and some who have organized, but not necessarily everybody,” Mesnard said. “At least not based on the conversations I’ve had with numerous teachers. They seem mostly focused on teacher pay. “I think a 20 percent raise, nearly $10,000, is a big raise that I think many will be happy about,” he said.